Recently I heard this verse, and it profoundly touched me, as if hearing it for the very first time. A most amazing experience occurred a few years ago when I began teaching as an adjunct professor at Indiana Wesleyan University at its teaching center in Hilliard, Ohio. The main campus is located in Marion, Indiana, the home of my college roommate from Purdue University, Art Faulkner, whom I had not seen in almost forty years. I thought about contacting Art and his wife Rita and letting them know that I was now teaching at the IWU campus in Ohio. Several months after thinking about the Faulkners, I received a call from Gary Anderson, a dear friend and fellow minister in Chicago, asking if I knew someone who had called him because this person had heard a teaching that I did for Gary and wanted to have my telephone number. Gary called and asked if I knew Rita Faulkner who wanted to contact me. I was amazed that just as I was thinking about Art and Rita, they were thinking about me. Perhaps even more amazing are the circumstances that unfolded the following week when I met the Faulkner’s son, Arthur Faulkner II, when we were both judges at a science fair at Sonshine Christian Academy where we both had mutual acquaintances. As it turned out, the Faulkners’ son lived in Hilliard, and when Art and Rita had visited him, they saw the logo of Indiana Wesleyan University on the building where the teaching center is located. They, of course, had no idea that I was connected with the University. When we finally talked, I informed that I had been thinking about them and wanting to make contact at the same time that they had been thinking about me and wanting to reconnect with me. We have talked and corresponded by email sporadically, and we had a chance to talk face-to-face when they showed up for a surprise celebration that my wife planned in celebration of my 70th birthday. What a joyful reunion it turned out to be. That delightful series of circumstances brought to mind a message that Apostle Eric Warren recently shared with the congregation at Equip U Ministries. In discussing the Spirit of Wisdom, which is one of the seven spirits spoken of in Isaiah 11:2, he expounded upon the Spirit of Wisdom in Proverbs 8. Apostle Warren’s book The Seven Spirits of God offers a much more detailed discussion of this often overlooked aspect of our identity as believers. As he touched upon the various attributes of the Spirit of Wisdom, I realized that just as we are encouraged to cry out for and to pursue with passion, wisdom, so likewise, wisdom is calling out for and pursuing those who are seeking her. Listen as Wisdom calls out! Hear as understanding raises her voice! “Wisdom is trying to get your attention! To follow Christ, I must ascend to the mountain top. As I seek to walk in his steps, where must I begin? Despite all obstacles that impede my progress, I will not stop. Wisdom, first of all, for it is the principal thing. God’s good pleasure is to rejoice over me and sing. With the fear of the Lord, here is where wisdom starts. Likewise, wisdom calls after me and does the same. In reflecting on the newly penned poem, I also thought of my experience with Art and Rita, all of which reinforced the message that I heard, as the Word of God was quickened within me in a most dramatic manner. This verse was, in part, the inspiration for a poem with the last five words as its title. This morning as I began my time of prayer and meditation, I opened up a Bible that was given to me prior to my being drafted into the Army in 1967 in the midst of the Vietnam War. The members of my home church Carter Chapel C.M.E Church in Gary, Indiana presented this small Bible with a zipper and with my name embossed in gold on the front along with the words “Holy Bible.” The zipper has pulled away from the binding and has not worked for years, and the first two letters of my name are barely visible with the rest of the letters having long since been worn away. As I opened to Genesis, the first few pages were missing as well as the pages where I recall there was an inscription. The first pages are not only worn and discolored from notes that were written in ink that has not blurred the frayed pages, but the edges of some of the pages have been eaten away by some kind of microscopic insect or parasite. As I look at this particular Bible, my mind is flooded with wonderful memories of my tour of duty in the military when I became more keenly aware of the presence of God in my life, as I was introduced to reading and studying the Scriptures in a much deeper way than previously. As I reflected upon that significant period in my life, I was inspired to write this poem. With this precious gift that from constant use is so worn. Them eaten away, devoured by a strange bookworm. I consumed it, hiding it in my heart’s deepest part. 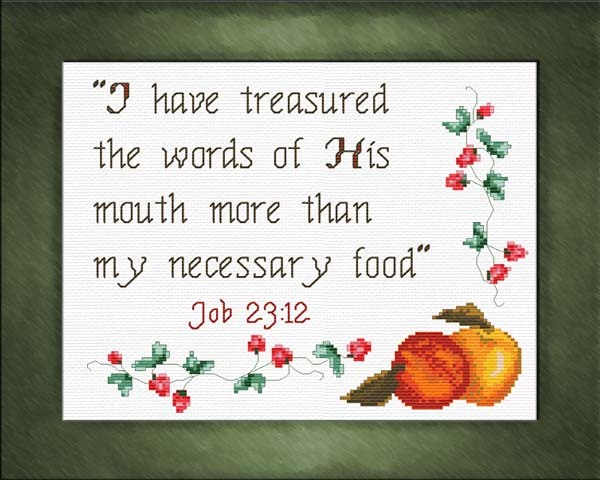 And esteemed His Word more than my necessary food. The poem opens with the lines from a children’s song that I recall singing way back in the 1960s. The Jeynetts offer a lively version of this children’s song sung so often at church camps or during pre-school activities or at other times when children gather. As I completed the poem I also recalled the lyrics to an original song that I composed when I coordinated a children’s summer program ten years ago and used music as a means of memorizing scripture. Oh, taste and see, see that the Lord is good, so good. Blessed is the man that puts his trust in Him. Taste and see that it is good. More than any kind of food. Let it richly dwell within. It will help you grow. It’s better than a vitamin. Read the Word and put God first. I thought I would share some of my reflective thoughts in another compounded recipe from Dr. J’s Apothecary Shoppe, my 100th blog entry.